We’ve been drinking some of the mead that I bottled a few weeks ago. Somehow we have very little left of Mead #2. It’s not because it’s necessarily so yummy, but because I said it was OK to drink some of #2. We didn’t make that much in the first place. And we’ve stored the bottles in a place that’s probably too convenient. I want to keep one bottle unopened for later, but until then we’re accidentally on the second-to-last bottle. So I better do some serious tasting notes on this one for future reference. I still haven’t yet found my notes on the recipes for each batch, but if I had to go by taste alone I’d say that this is the one that was partly based on Joe’s Ancient Orange Mead. I didn’t follow that recipe exactly because, in general, I hardly ever follow recipes exactly. I suspect batch #2 is based on Joe’s Ancient Orange Mead (JAOM, JAO, or AO) because I detect a few notes of mild orange and cloves. I remember going really easy on the cloves because I read of others who warned that the cloves can easily overpower the mead if you’re not careful. It’s much easier to add more cloves later if you want. I know that to be true from cloves in lengthy tea steepings. The aroma is faintly of honey and wine and slightly fruity. There may be just the very faintest hint of a rubbery smell. The taste is of unsweet mild honey with just a hint of orange and spice. It is slightly tangy and a little bit bitter. Dave describes it as watered down honey with orange peels that have been soaked in water for a week and then some pure alcohol added. I think he partly finds it to be “watered down” because of the overall lack of sweetness. The color is light golden topaz and beautifully clear. I added a bit of buckwheat honey to all of the batches — some more than others — so the color of each is darker than if I’d used a pure orange blossom honey. I’d say it’s somewhat lacking in body. Like all our batches to date this one is quite dry. Nearly all sugar has fermented out, so this doesn’t have the traditional sweetness of mead. I’d guess it to be between 14% and 18% alcohol. It’s not so much that you taste it, but it has the mouthfeel of a stronger wine and we can feel it in our toes after drinking a fairly small amount of it. I definitely feel it more than a 12% wine. I notice a bit of a burn after it goes down. As I wrote above, if I try really hard I can detect a bit of that burnt rubber smell and taste, so I think this is the one that smelled strongly of rubber at one point. I’m not even 100% sure if it’s still there. If I hadn’t been specifically trying to smell it then I probably wouldn’t notice that at all. It is really faint now, and nothing like what it was at about six months old. So this is definitely something to remember about how much mead can change as it ages. The pH is about 3.2 based on a traditional science kit pH strip. With that strip I have to do a little guessing based on the color since the chart doesn’t have tenths. The pH strips made specifically for the fermentation process read about 3.1 to 3.2. These strips are much easier to read down to a specific pH for home fermentation. It’s good to see the consistency between the two. I’m attempting to back-sweeten this second-to-last bottle since I don’t have much of anything else to play with for batch #2. Back-sweetening is when you add a sweetener after the fermentation. This adds, well, sweetness. I’ll be adding some wildflower honey. Different strains of yeasts have differing levels of alcohol tolerance, so it’s one of several things that can make a difference in the dryness or sweetness of your creation. In making wine or mead, the yeast will die off once the alcohol reaches a certain level, so there can be sugar left over. With some yeasts, if you don’t have too much overall sugar (from honey or other) some yeasts just keep eating the sugar until there’s nothing left. Red Star Premier Cuvee may keep going until it reaches 18% alcohol, but that’s fairly high. I used Cuvee in at least one batch and Cote des Blanc (lower tolerance) in another. My notes would tell me which was which. Fermentation stops once it has reached the yeast’s alcohol tolerance level or all the sugar has been converted to alcohol. If I add honey or other sugars to bottled mead there a risk of restarting the fermentation. Too much of that and the bottles can explode. A little bit and the mead (or wine or cider) can become bubbly or carbonated. It’s a very tricky balance. Bubbles are a good thing with cider, but I have no desire for sparkling mead for now. There are additives you can put in each bottle to prevent fermentation from happening, but I’d like to keep our additives to a minimum. I blended about two tablespoons of a flavorful wildflower honey to about 440 ml of dry mead. This was more than enough to sweeten it. In fact, I could have done with less. The pH with the added honey reads more of a 3.2 to 3.3. The pH strip is only the slightest hint darker. This honey gave the mead much more of a traditional sweetness with lots of honey aroma and flavor. I still notice a bit of very mild orange and a hint of spice with a little bitterness. The finish is tangy. Back sweetening with honey has made the mead a wee cloudy, but that might settle out if we left it for a while or get worse if fermentation starts up again. 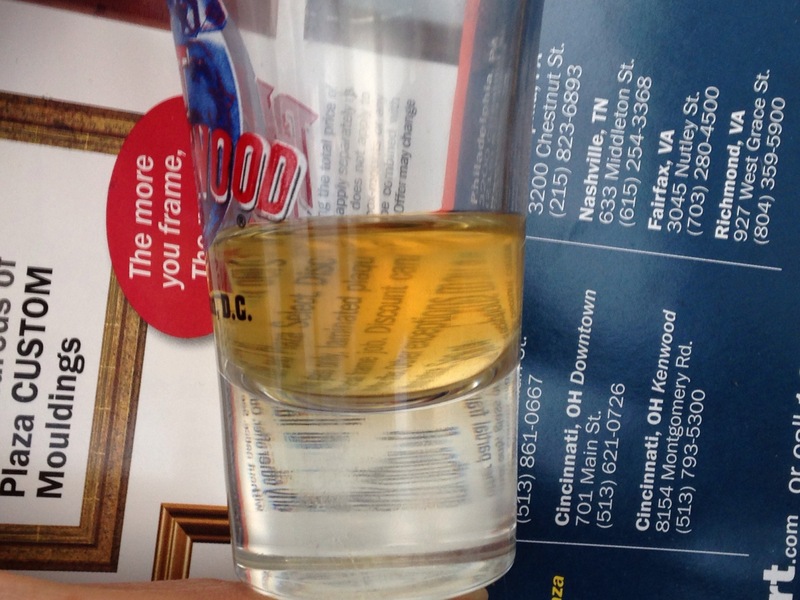 There’s a huge difference in the body of the mead. I’d definitely try this again when we want a sweeter mead. This is actually pretty yummy stuff. I like dry mead more than I thought I would, but I’d also like to try making a sweeter mead that I don’t have to back sweeten. Overall I think we’re fairly happy with this mead. I’d like to try a similar version again in the future. 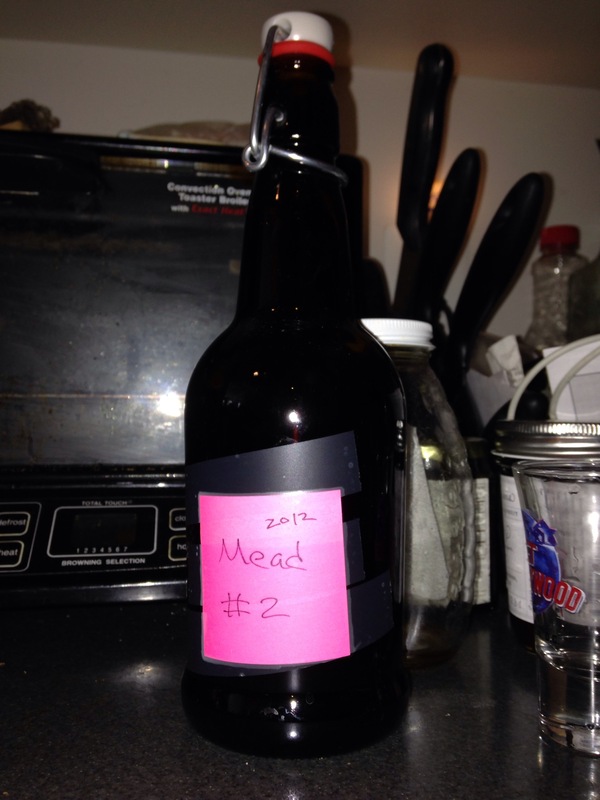 In May of 2012 we started trying to make our own mead. We made three separate batches, all done around the same time, but done differently — different types of honey, different additives, slightly different overall process. Letting it sit for a while and tasting it at various stages, we FINALLY bottled it today. Talk about taking our time! Mead takes a long time, so maybe this is somewhat appropriate. At an earlier taste test one of the batches had a distinct sort of rubber aroma which was quite yucky. I’m pleased to say that wackiness has aged out completely. Whew! Just goes to show how important it is to age mead. One of the batches, batch #1 as it would happen, was pretty good at the six month mark, but we decided to let it go longer as mead is supposed to take a while to age properly. At that time I made some cyser because I wanted to try something that was quicker. The cyser was not bad. I still have one bottle of it. I kind of wish I saved two. Oh well. Mead batch #1, the one that was a fairly nice at six months, has lost nearly all of its sweetness now. In fact, I’d have to say the same for all three batches — all dry and not really sweet at all. I guess that’s somewhat to be expected. Maybe. Two of the batches taste fairly strong now. As I didn’t own a hydrometer when I started the mead (kicking myself), I don’t know the actual alcohol content. I can guess, however, and if I compare to other known beverages, I’d guess these are the high end of what the yeast tolerated, maybe 14%? Maybe 16%? 18%? Ack. I REALLY wish I could find my notes. I HAVE them. Somewhere. That would tell my the exact type of yeast I used and the recipe for each of these batches. I don’t mind the dryer mead. It’s has a beautiful aroma. One of the batches tastes close to a dry white wine. Not bad, but it’s not really the traditional mead that I was going for either. 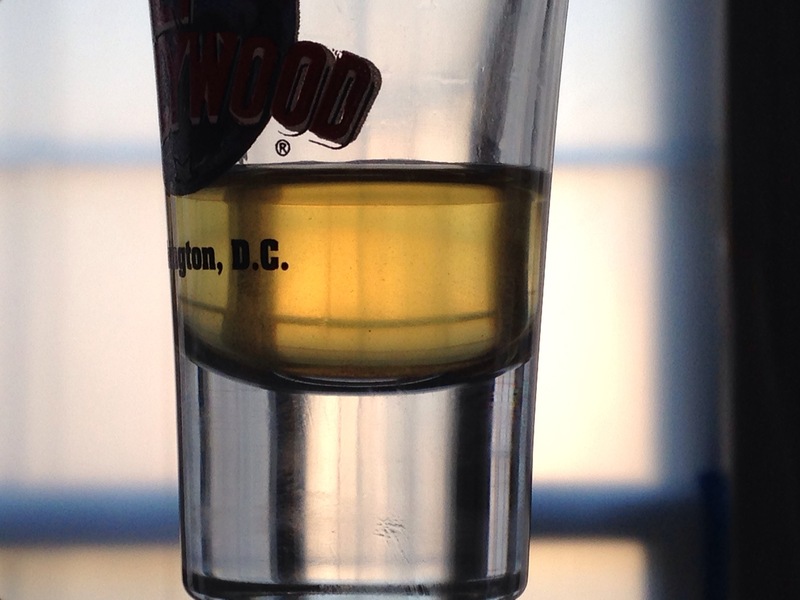 Two of the batches seem a little strong, a bit like firewater. So maybe this stuff is good for dry mead that just needs to age a bit more. Um, don’t know. I think I’ll leave all to age longer except for the two bottles that didn’t get filled all the way. Those are free game for experimentation! I’ll get out my mad scientist/mixologist hat. I may try back sweetening a bit to get more of the sweeter honey-mead flavor that I’m used to. Maybe I’ll add a bit of acid to one of the batches as it seems a little flat. And I need to find those notes. I can probably be snobbish about tea and maybe mead and some kinds of food. Except that, really, I’ll still drink or enjoy just about any kind. I adore good tea — perfect jasmine green infused with the scent of actual blossoms, not just added flavoring. That’s snobbery talk right there. A Greener oolong that has matured into a delicate floral or a darker robust oolong from Taiwan. Yum! New Darjeeling you think is great? I’ll try that too. I like a good basic mead — Chaucer’s the kind we can get at our local Renaissance Festival and elsewhere is certainly enjoyable. Fox Hill Special Reserve which is made with a darker honey has a bit of bitterness and a lot of depth. Some Redstone Mountain Mead can be impressive too. It’s real mead made in small batches — some can be bitter and some wonderful. They even date the batches, so you’ll want to get more of the same date if you like a batch. That’s mead for a mead snob for sure. Unless I’m allergic, it could poison me, or it’s a dish that exhibits unusual cruelty, I’ll usually try any kind of food. I read about a Japanese dish called Ikizukuri where live fish is sliced and served still moving. I think I’ll avoid that, thanks. But I do love to taste a variety of new things! I love gourmet dishes that have the perfect balance of flavors, colors, and textures, but I also love hot dogs from gas stations that have been roasting on those metal rollers for hours thus reducing water content and enhancing flavors. You do not know a good hot dog if you turn your nose up at those things. So maybe that’s makes me a hot dog snob. Is it wrong to have a hot dog with my beautiful jasmine tea? Maybe. The darker oolong would probably be better with hot dogs. Planning where people sit at a dinner party would be like a special kind of torture to me. I can’t help but shake my head at this type of contrived social stuff. I prefer a gathering that lets guests sit where they like. Hors d’oeuvres and cocktails then meander to the table. I understand why people might assign seating. For example, somebody’s Aunt Gloria and Cousin Martin argue which makes everybody miserable. Don’t let them sit next to each other. Fine. I figure those people will probably avoid sitting next to each other anyway, and if they don’t we’ll adjust as needed if there’s a problem. I don’t mind sitting next to anybody in my family. And I like sitting next to new people. On the other end of that social spectrum, there are times you might want to seat folks next to each other because you’re sure this will be a good thing. Perhaps there’s a gathering of dignitaries whom you’re convinced will facilitate peaceful agreements if you give them talk time at a relaxed dinner party flowing with their favorite single malt. Go for it. You want to hook up Tim and Juanita because you’re sure they will really like each other. OK. If I was having a high-level important dinner party, I might consider hiring somebody who loves to do that planning kind of thing. There are people like that. Maybe I’d ask a friend for advice. What I’d really like is to have a buffet so people could sit and eat what they like and occasionally return for seconds thus allowing guests to shuffle seats so that they can talk to a variety of people. That sounds like fun! I want to talk to everybody and let them do the same. For that matter, since I’d want to have a variety of excellent food too, a good buffet seems like the way to go. People can eat what they like while sitting where they like. So let’s say I’m having a dinner party, and we’ve established that I’m not going to stress over who sits where. I’d probably want to invite John and Hank Green and their wives. I’ve enjoyed vlogbrothers videos for years. John is a writer, and Hank, a musician. I love John Green’s writing. He seems like he’d be very cool to talk with at a party. I first saw vlogbrothers videos when Harry Potter Deathly Hallows was being released, and Hank sang “Accio Harry Potter.” It was great! I felt like there were like-minded people in the world! Other than Hank, I’m not really in awe of having musicians as dinner guests, so I’m probably not going to invite more unless they’re there purely for entertainment, they also do something else, or they happen to be somebody’s spouse. Don’t get me wrong, I love music. I love musicians. I’d invite Samuel Clemons — he was great on Star Trek TNG! (Yes, I know he wasn’t really on ST:TNG.) But he really seems like he’d be a good conversationalist at a party. Joanne (J.K.) Rowling and her husband. I’m a pretty big Harry Potter fan (see above), and she seems like a sharp lady. I’d probably ooze with fangeekness and embarrass myself, but I would not care. Maybe John Scalzi and his wife because I’ve enjoyed his blog for decades (not actually decades, more like decade plus) and his books too. And I’ve maybe already had dinner with them before a long long time ago, but that’s another story. So then perhaps I shouldn’t invite them, but that would probably be wrong because I think it would be fun. I’m at nine people and not yet done with my list. That was fast. I’d like to invite Ray Bradbury. I’d question him on how not driving works for him because D doesn’t drive either. I’d like tips on making that work well. Also his were some of the few science fiction books on my high school reading lists, so I got to read him and get school credit. What’s not to like? Do I have to count spouses in the 4-8 people limit? I mean, can it be 4-8 notable people and the rest are an unspecified number of other invitees? ‘Cause, if so, I’d invite spouses, and I’d like to invite friends and family who would enjoy this little shindig too. If I’m strictly limited to inviting only 4-8 people total, then I guess I’d have to drop Scalzi and his wife because I’ve not met the other people before. Hold on. Kurt Vonnegut. I forgot about Kurt Vonnegut. I’d like to include him. Would it be rude to drop some of the spouses? I remember being a young teen or tween and catching the movie Slaughterhouse-Five on late-night TV. I was supposed to be asleep and every ten minutes or so I’d tell myself I’d watch for only ten minutes more, but I watched the entire movie. More recently, I read Vonnegut’s Advice to the Young on Kindness and more. I love that he can admire Jesus without being Christian. I wish everybody could appreciate the teachings of wise people without having to take sides on religion. I love Vonnegut’s take on kindness and forgiveness. I think more of both would go a long way toward making the world a better place. There seems to be too much eye-for-an-eye mentality, today, and, well, ever. Wait! I just remembered another one to invite … And, what, I only invited one woman? That can’t be right.